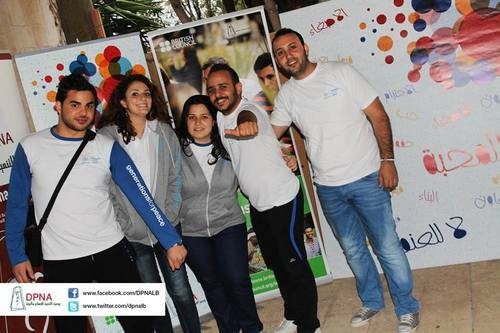 Amman Camp ’13 Lebanese Delegates Make Moves! The Amman Camp 2013 came to an end less than a month ago, and already our Lebanese Delegates have started to spread awareness about Generations For Peace. 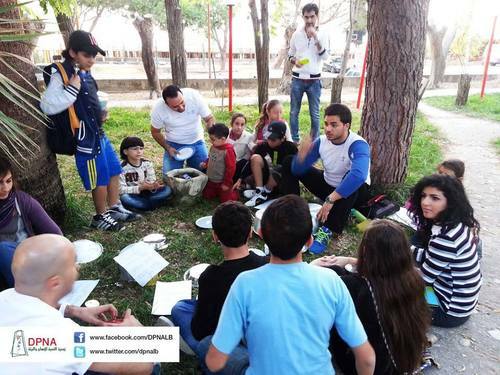 On November 29th, the Development for People and Nature Association (DPNA) organised the Saida Hyde Park for Peace in Dar Al Inaya, Salhiyi. This event, which encouraged open dialogue on the subject of civil peace and the contribution of youth to peacebuilding, included an Art For Peace Corner organised by our Delegate Elissa Shamma. The contribution made by Generations For Peace volunteers to this innovative event commenced with an Art For Peace activity led by Nour Heneine and assisted by Riham Zein. The activity – in which 15 children and youth were asked to compose music (using kitchen utensils including cups, trays and pans) – introduced the participants to the power and simplicity of music. Not only did Nour’s singing (which the music was made to accompany) discuss the importance of peace, the supportive environment created during the execution of this activity exemplified excellent leadership. Thereafter our Delegate, Ayman Touk, held a second Art For Peace activity where he asked 10 participants to draw what peace signifies for them. This creative approach allowed the participants to express ideas and emotions that they may not have been able to articulate through words. After the drawings were complete, Ayman facilitated a discussion where he gave participants the opportunity to discuss their notions of peace.The Generations For Peace session, held within the DPNA event, concluded with Ali Soudi providing an information session on Generations For Peace. At the close of this session 25 individuals provided their contact information to our Lebanese Delegates requesting to become involved in future GFP programming. Well done to our Lebanese Delegates (depicted above), we are proud of you! Pass it on!